Moonlight Madness is an exciting time each year. From July 21-August 5, Silver Dollar City is open later and guests will enjoy some extra fun! Each night guests can take part in a couple of spectacular shows. Choose between a Street Dance featuring Prince Ivan or Hits from the Hollow! Both will be sure to ‘wow’ the crowd! If you are looking for the perfect place to watch the Hits from the Hollow show, head up to the Culinary & Craft School. Enjoy a delicious dessert and refreshing beverage as you relax in a comfortable rocking chair on their back porch. It’s the perfect seat to watch the show and enjoy the beautiful fireworks finale. Their special desserts that will be featured include: chocolate cake, hummingbird cake, lemon poppy seed bread, and blackberry cobbler. Be sure to check their schedule to see when this location is open and what dessert will be featured on each night. Be sure to check out Moonlight Madness specials on select food and merchandise throughout the park. Enjoy food specials such as $5 funnel cakes, $3 ice cream floats, $1 off kettle chips, and so much more! Also be sure to stop by the clothing, taffy, and speciality stores after 5pm for extra discounts. 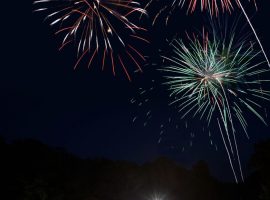 For an extra special finale of the day, enjoy fireworks right after the Hits from the Hollow show. An evening at Silver Dollar City during Moonlight Madness will be sure to make your day even more spectacular!